7am to 7pm closed on Sunday. WATER PRESSURE: There has been an increase in water pressure throughout the Temecula and Murrieta area over the past few years. Most people do not even know they have a pressure regulator at the house, or how to check it. The pressure is vital to the workings of your plumbing system. Too much PSI can ruin your water heater, burst supply lines to plumbing fixtures, cause toilets to run, faucets to drip and worst of all, put a strain on your entire plumbing system which may result in extensive damage and costly repairs to your home. You can check the water pressure by purchasing a psi gauge from a local hardware store. 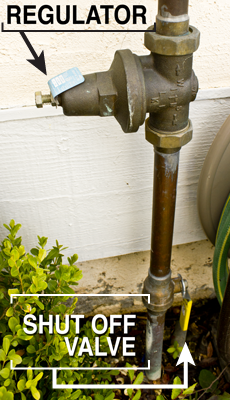 Before checking the pressure, make sure that water is not running anywhere in the house or yard. Connect the gauge to the hose bib and turn on water at the hose bib. The pressure should read between 55 and 65 psi. The legal limit set by the state is 80 psi. If the pressure is above 80 psi, then the regulator is not functioning correctly and needs to be replaced. The life expectancy of a pressure regulator is approximately 5 to 10 years. 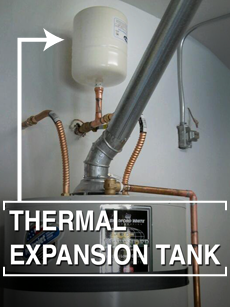 THERMAL EXPANSION: As water is heated, it expands in volume and creates an increase in pressure within the water heater. This is known as "thermal expansion". The extra volume of water caused by thermal expansion must go somewhere. There are 2 main reasons for thermal expansion. (1) A check valve has been installed at the meter or house which is referred to as a "Closed Water system". (2) There is a wall of high water pressure prior to the pressure regulator. Therefore, if you have a "closed water system", or high water pressure prior to the pressure regulator, then a "THERMAL EXPANSION TANK" should be installed above the water heater. This small tank with a sealed compressible air cushion provides a space to store and hold the additional expanded water volume. MAIN WATER SHUT-OFF: Everyone in the family should know where the main water shut-off valve is located and how to shut off the main water supply to the house. It takes only a few minutes for water damage to occur and the faster the main water supply is shut off the less damage to your home and property. There are 2 valves to shut off water supply to the house. One is located at the water meter box, which may be difficult to access. The other one is at the structure of the house near the front hose bib. If the shut-off valve is round (like a wagon wheel), it may not work properly and can get stuck in the off position. You may also have the same type of valve above the water heater. I recommend changing these "old style" gate valves to the lever handle 1/4 turn ball valves. They are much more reliable and easier to use. The gas shut-off valve is located approximately 6 to 8 inches above the ground level on the pipe feeding into the meter. The meter is usually located on the outside of the garage furthest from the front door. You will need a very large wrench to turn off this valve. Helps Prevent Extreme Local Water Pressure from damaging your homes pipes. This tank is in addition to your house regulator. Old Regulators can fail to work without the homeowners knowledge, resulting in damage from bursting pipes. With the installation of a Thermal Expansion Tank we recommend a new regulator with a 1/4 turn Shut Off Valve.